Remembrance: Elizabeth Bunnell Bauder | News and Features | Style Weekly - Richmond, VA local news, arts, and events. 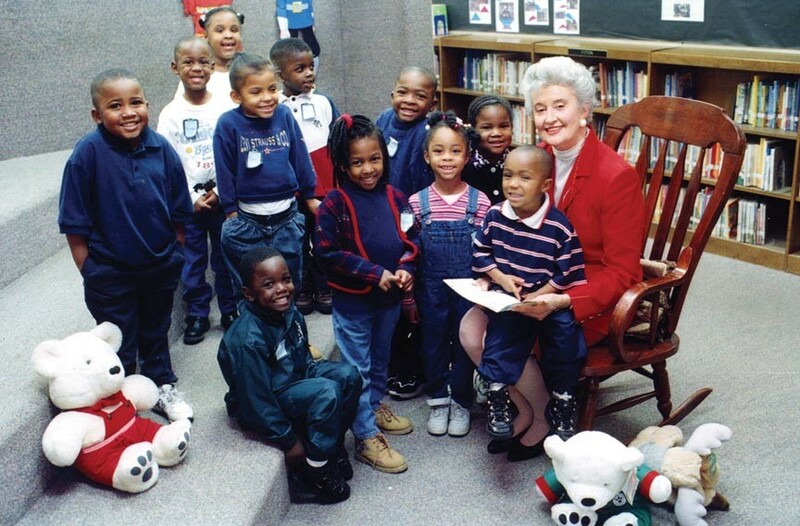 With Snow Bear nearby, Betty Bauder reads to children as Richmond’s Christmas Mother in 1998. On June 19 eulogies for Betty Bauder were delivered, prayers said, hymns sung. Then the organist let rip a joyous "Hallelujah Chorus," and Bauder's family, friends and former colleagues from the former Thalhimers department stores filed out of St. Giles Presbyterian Church. If they'd glanced at the sanctuary's elegant marble floors they might've been struck by how the black and white checkerboard channeled the distinctive packaging of Thalhimers' fine foods department. Indeed, just a few minutes earlier during the service, another Thalhimers icon was invoked — Snow Bear. Bruce Miller, artistic director of the Virginia Repertory Theatre relayed how for many years he'd donned the furry costume — at first because he needed a job and later because he loved being part of the popular holiday tradition. It was Bauder who in 1972 created Snow Bear, a soft and cuddly holiday character and just one of scores of imaginative and successful promotional campaigns she spearheaded for the emporium's 26 stores in four states during her 40-year career. Before going out of business in the mid-1990s, Thalhimers was one of downtown's biggest retail destinations. A native Richmonder, Bauder graduated from Collegiate School for Girls and finished Mary Washington College in 1951. She joined Thalhimers as an advertising copywriter, but her career spiked in 1971 when she became vice president of sales promotion and visual presentation. It culminated when she retired in 1990 as senior vice president and sales promotion director, the company's top female officer. "She was a pioneer," says Harry R. Thalhimer, a former company executive, reflecting a few days after the funeral on the challenges of being a woman who broke glass ceilings throughout a storied career. "I never saw her get angry, never heard her raise her voice, but she could give you that look, that way she peered at you over her glasses." "Everyone could be addressed as 'sweet pea,'" Marion Horsley relays in an exchange of remembrances when Bauder's admirers heard of her death June 5. "It could mean anything from 'you dolt' to 'you darling.'" "Mrs. B. was a lot of fun to work for but feisty and very demanding," says Sharon Fuller, a former Thalhimers creative director who adds that the advertising department could be a pressure cooker. "We produced 400 [display] ads a week — cut and paste — in the days before we had computers." After the funeral a bevy of Bauder's former associates repaired to Joe's Inn in the Fan for dinner and more reminisces. Settling into a back booth, they all donned now-collectable, cardboard Snow Bear ears. Repeatedly, upon recognizing the insignia, other diners interrupted the Thalhimers alums to share their stories of Thalhimers at Christmas. If for many people, "Betty Bauder was Thalhimers," as one admirer said last week, then so was the character she created, Snow Bear. "She had such impeccable style and good taste," says Robert Watkins, a Richmond interior decorator and long-time friend. "She will be sorely missed."